Read on to learn dart board rules along with tips for playing better. 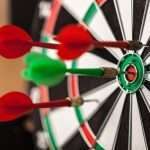 The equipment needed to play darts is widely available and relatively inexpensive, and the game does not require a large amount of space, making it popular in homes and small bars. The only equipment required is a dartboard and at least three darts. A standard dartboard, used in international play, is circular and measures 18 inches in diameter. It is divided into 20 equal sized pie-shaped pieces. Each pie-shaped wedge is numbered, reflecting the number of points scored when a dart lands in that wedge. The board has a bullseye in the center which is divided into inner and outer sections. It has a ring around the outside and another about halfway between the outside and the bullseye. These rings are called the double ring and the triple ring, since a dart that lands within one of the rings will double or triple the score of the wedge, respectively. The dartboard should be hung flat against the wall, with the number 20 at the top. 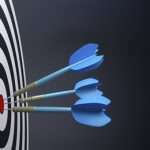 The distance from the center of the bullseye to the floor should be 5 feet 8 inches. Place the throwing line 7 feet 9 ¼ inches from the wall. The throwing line can be a piece of tape or a thin piece of wood. There should be at least two feet behind the throwing area for the players to stand. Darts have a steel point that is either 32mm or 41mm long. The barrel of the dart is usually made of nickel-steel, brass or tungsten alloy. The barrel may be shaped like a cylinder, a torpedo, or may be tapered at both ends. A plastic shaft adds length to the dart and secures the flights, which look like feathers but are often made of plastic. In competition, the dart must weigh 50g or less and must be no longer than 300mm in total. To throw the dart, grip the barrel, aim the dart at the board, and throw straight at the board. The way a dart is thrown and flies varied depending on its length, weight, shape and material, but the choice of dart is largely a matter of personal preference. Electronic dartboards keep track of the location of each dart and keep track of the score. An electronic board is covered with small plastic nubs that hold the dart in place after it is thrown. Electronic boards are popular for use in homes since they are accurate and convenient, and because the dart has less chance of bouncing off the board. They can also be used for practice. In most pubs and bars where darts are taken seriously, and in competitive play, traditional boards made of sisal fibers or cork are used. There are several variations on the game, but most commonly, each player starts with a score of 301 or 501 points. 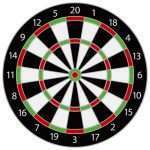 When a player throws a dart, points are subtracted from the player’s current score depending on where the dart lands on the board. Darts can also be played by two teams of two players each. 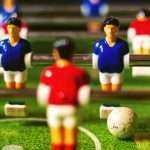 When playing with a team, the game may start with a score of 701 or 1001. There is no time limit. Players or teams flip a coin. The winner of the coin toss throws a single dart. The opponent then throws a single dart and the player with the highest-scoring dart begins the game. The players alternate throwing three darts per turn. If a dart lands in one of the wedge-shaped pieces, it receives the number of points indicated outside of that wedge. If it lands in the double ring, the point value of the wedge is doubled. If the dart lands in the triple ring, the point value of the wedge is tripled. If the dart lands in the outer bullseye, it counts for 25 points. The inner bullseye has a value of 50 points. Points are subtracted from the current score on each turn, and the object of the game is to reach a score of zero and to have the final dart land in the double ring or the bullseye. If a player reaches a score of 1, or a score of less than zero, they are said to go bust, and their score reverts to what it was at the beginning of the turn. For example, suppose a player begins their turn with a score of 110. The first dart scores a double 10, for 20 points. The second dart scores a double 20, for a total of 40 points, leaving a score of 50. If the final dart the player throws is an inner bullseye, they win the game. 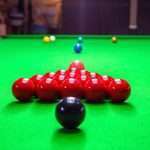 If a player going into their turn with a score of 110 scores a double 20, then a double 15, and then scores an inner bullseye, they go bust since they scored 50 points when they had a score of 40. For their next turn, the player’s score reverts to 110. A player with a score of 110 who scores an inner bullseye, followed by a double 20, followed by a single 20 would also go bust. Even though they reached exactly zero, the final dart was not a double or a bullseye. On their next turn, they start again with a score of 110. One round of play from 301, 501 or more points to zero is called a leg. A set is made up of an odd number of legs. A set can be a best-of-five, best-of-seven or some other number of legs. A match can consist of any number of sets. The winner of the majority of the sets is the winner of the match. Like many social games, darts has its own guidelines for good sportsmanship. If you are just learning to play, knowing the etiquette of the game will help you feel more comfortable playing with those who are more experienced. While many regular players are competitive, they are also understanding of players who may be less skilled. Leave your darts on the board until they are scored. 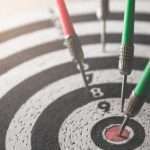 Whether you are scoring your own darts or using a scorekeeper, make sure the score is written down before you pull your darts from the board. This allows your opponent to verify the score if they are unsure of where one or more of your darts may have landed. If another player has a good turn, compliment them when their turn is over. Stand well behind the player who is throwing. Don’t move suddenly or come up beside the shooter. This is a safety issue as well as an etiquette issue. If you are playing in teams and the partners are assigned randomly, don’t disparage your partner even if you think they are a weaker player. Likewise, if your partner makes a poor shot, words of encouragement will go farther than criticism. Don’t tell the shooter the score of any dart or suggest what they should aim for, unless the shooter is a teammate. The world of competitive darts is governed by the World Darts Federation. Tournaments are held worldwide, and competitors include men, women, boys and girls. The World Darts Federation publishes official rules for competitive darts, ranks competitors and enforces rules regarding doping and alcohol consumption during tournaments. The Professional Darts Corporation also holds competitions, primarily in the United Kingdom. The PDC holds the World Darts Championship, World Grand Prix, Grand Slam of Darts, World Series of Darts Finals and other televised events. Regional events are held in Australia, North America, and Europe, with winners of these events qualifying for world events. Darts is a fun game for amateurs and competitors alike. 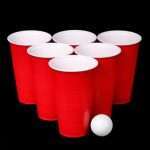 It’s easy to learn and can be played with a minimum of equipment and space. Whether you play in an organized league or pick-up games in your neighborhood pub, you’ll enjoy some friendly competition and camaraderie in a game of darts (provided you know the dart board rules!). Thanks for reading! I hope you enjoyed learning the ins and outs of the game of darts. Have you played darts before? Do you plan to start? Tell us in the comments below.